This chapter reviews bibliometric studies of the social sciences and humanities. SSCI bibliometrics will work reasonably well in economics and psychology whose literature shares many characteristics with science, and less well in sociology, characterized by a typical social science literature. The premise of the chapter is that quantitative evaluation of research output faces severe methodological difficulties in fields whose literature differs in nature from scientific literature. 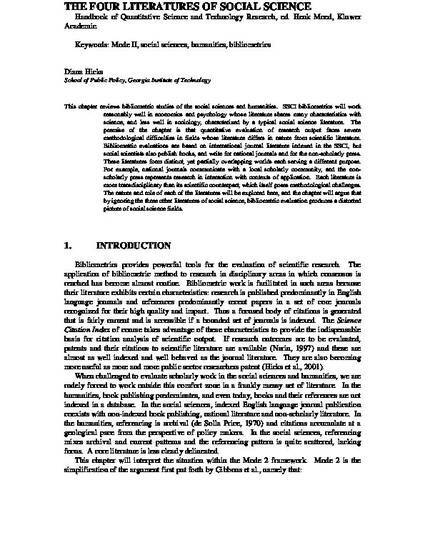 Bibliometric evaluations are based on international journal literature indexed in the SSCI, but social scientists also publish books, and write for national journals and for the non-scholarly press. These literatures form distinct, yet partially overlapping worlds each serving a different purpose. For example, national journals communicate with a local scholarly community, and the non-scholarly press represents research in interaction with contexts of application. Each literature is more transdisciplinary than its scientific counterpart, which itself poses methodological challenges. The nature and role of each of the literatures will be explored here, and the chapter will argue that by ignoring the three other literatures of social science, bibliometric evaluation produces a distorted picture of social science fields.